I was on a serious book kick this past week and after finishing The Hunger Games, I tried to "check out" the sequel and it was not available. 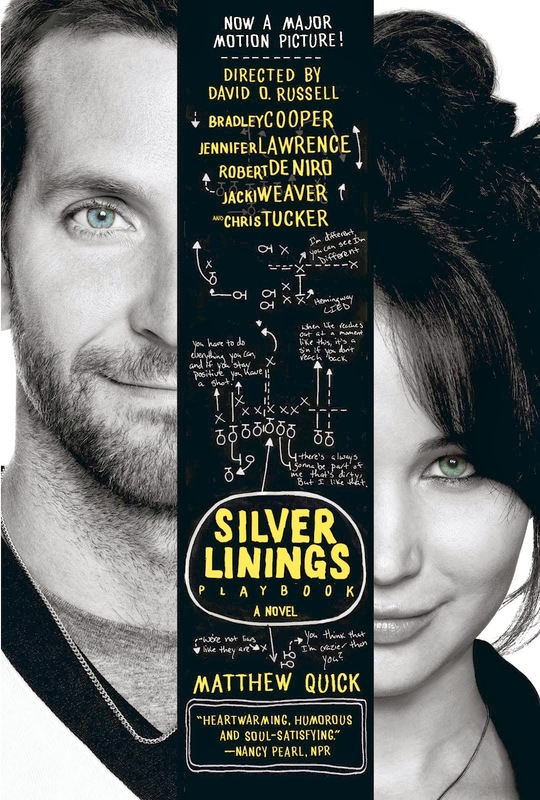 I needed something to fill the void, so I started looking through what was available on the rest of my "wishlist" from the local library, and I decided to give The Silver Linings Playbook a go. I'm sure many people have seen the rather successful movie by now, but if you are like me and haven't I'll clue you in. Pat Peoples is in a tragic accident that puts him in a mental health facility for quite some time. The story picks up when his mother arranges for him to be released in her care and brings him back home to New Jersey to try to give him a life again. Pat soon realizes that he can't remember about 4 years of his life. He decides that his life is a movie that God is making, and he's had so many bad things happen that he is waiting for his 'silver lining' at the end of his movie. He spends his time working out to impress his estranged wife in hopes she will see he is a changed man and want to end their "apart time". Pat becomes obsessed with his fitness routine and the Philadelphia Eagles and those take up most of his time. His family avoids talking about his wife at all, and his therapist constantly questions why Pat is still so bent on impressing his wife when he has had no reason to believe he will see her again. Pat talks constantly about his wife to everyone, always mentioning how he was a bad husband and has changed himself completely to be kinder and treat his wife how she deserves in the future. Pat becomes friends with his childhood best friend's wife's sister, Tiffany, shortly after moving back. Tiffany's husband died a while before and she has been dealing with her own mental health as well. At first Pat thinks Tiffany is strange, but they become friends and begin to help one another more than either of them realize. Tiffany enlists Pat to dance in an Dance Away Depression showcase in exchange for helping him communicate with his wife. I feel like I shouldn't reveal more of the story in case you should decide to read this book, which I would absolutely recommend. Pat is a very endearing character. He is 34 but kind of talks and thinks like a teenager, which you come to learn is a result of his unfortunate accident. He has glimpses of true adulthood though, so you know that the old Pat is still in there somewhere, and parts of him are deliberately suppressed in an effort to be a better man for his wife. There is a great deal of football jargon in this book, and though I am in no way a football fan, I came to see why it was so important to Pat. I still laugh to myself when I think of Pat's nightmares about Kenny G (Pat's nemesis) standing over him and evilly playing Songbird, as well as the big dance scene that is choreographed to Total Eclipse of the Heart. These two instances alone made me look forward to seeing the movie, but I am told that neither of those things are depicted as such in the movie which makes me sad, lol. I quickly fell in love with this story and couldn't get enough. I listened to the entire audiobook in just over 24 hours. It's a quirky love story with a lot of humor and meaning. This book was absolutely up my alley and it was nice to enjoy a book this much again. Don't get me wrong, I've enjoyed other books too but I connected more with this story. Pat is so optimistic and even though you soon realize that his hopes of reconciling with his wife will probably never be fulfilled, you can't help but hold out the hope yourself. If you're in the mood for a meaningful look at a different kind of life, I recommend you give this book a try. I give this book 5 out of 5 stars.